Locations: San Francisco, Oakland, Berkeley, Siskiyou Line, Redding, Dunsmir, Black Butte, Ashland, Crescent Lake, Klamath Falls, Alturas, Modoc Line, much more…. Sources: Ed Maas, Louis Stein, Will Whittaker, and Don Olsen are featured. There are many more listed. 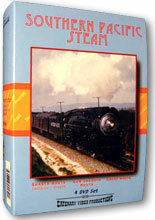 Southern Pacific Steam is a 4 DVD boxset from Catenary Video Productions. Each show is available individually. Every volume will have a review on ATVR. A rollup review of the entire set will be provided upon completion. This set was digitally produced in 2007. 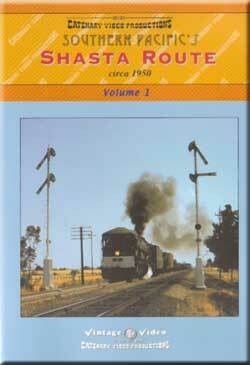 This first volume of the fine series, covers SP’s Shasta Route. This trackage ran from the Bay Area to Portland, Oregon. The locations are mainly in California for this show. 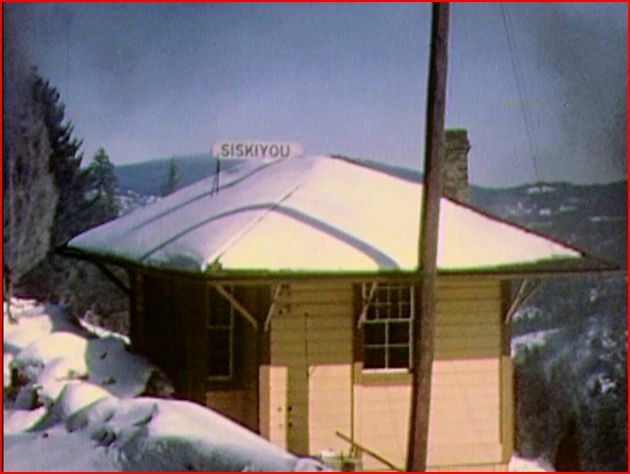 The Siskiyou Line to Grants Pass is included. The package label states as: circa 1950. Actual years were the late 1940’s to 1957. 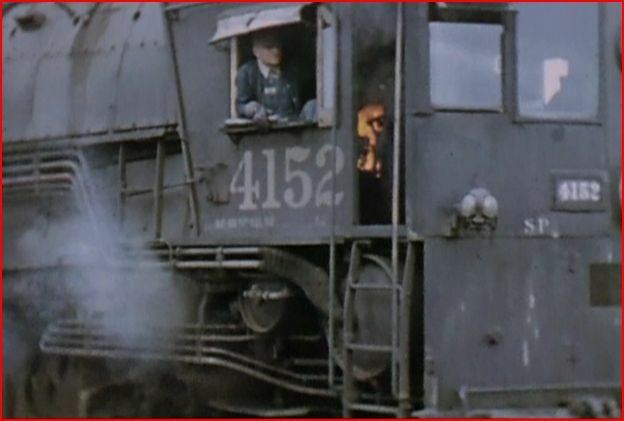 Even 1938 footage of early cab forwards operating! Steam is mighty in this era, on the SP. Diesels are making significant inroads. Hauling name passenger trains, the diesels do prove their worth. The DVD has a chapter menu on the main screen. A series of maps are at the beginning. Other geographical and operational details are in the narrative. The progress of the journey continues with maps throughout the show. This program is nearly an all color film presentation. A little black and white film too. Some still photos and a few illustrations round out this volume. Everything viewed is high quality. We start with a look at the San Francisco- Oakland ferry service. The Oakland station was the origin for many name trains. Diesels like Alco PA’s and EMD E7’s at Berkeley, are harbingers of changes to the future. They do like nicely attired, wearing the SP Daylight livery. 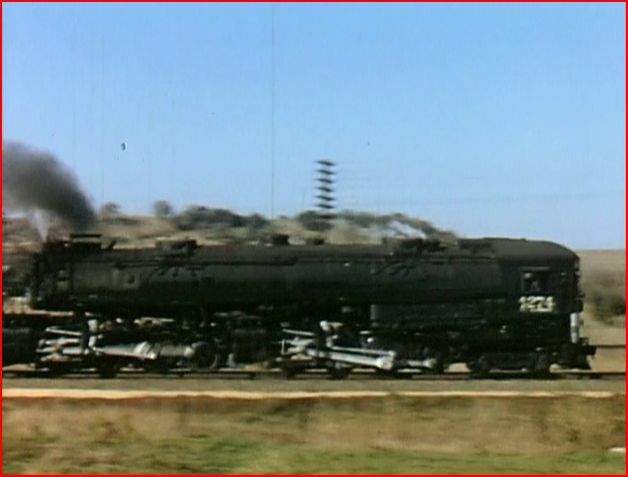 Some F7’s in the black widow scheme are seen on a freight. 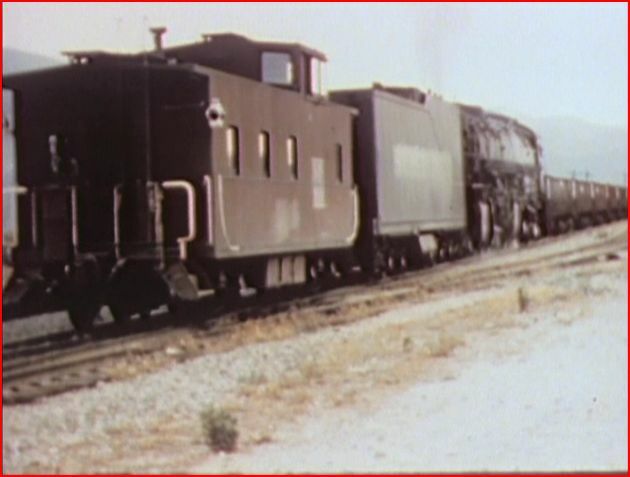 San Joaquin Daylights are still hauled by the now downgraded SP, GS- class, steam locomotives. Cab forwards are a sight to behold. They are viewed on multiple trains. The scenic Siskiyou Line gets featured, with plenty of highly detailed coverage. Here, McCloud River gets a quick look. 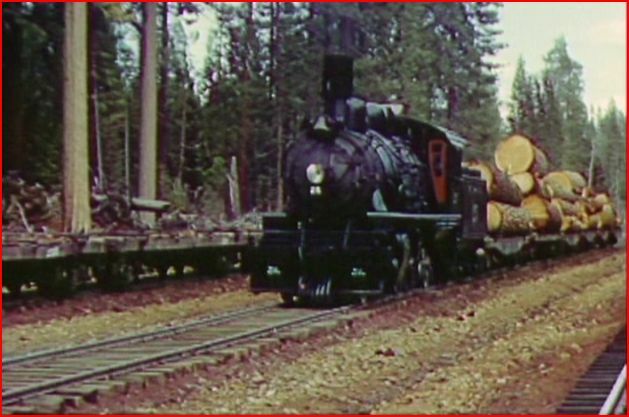 Prairie #25 leads a logging train. 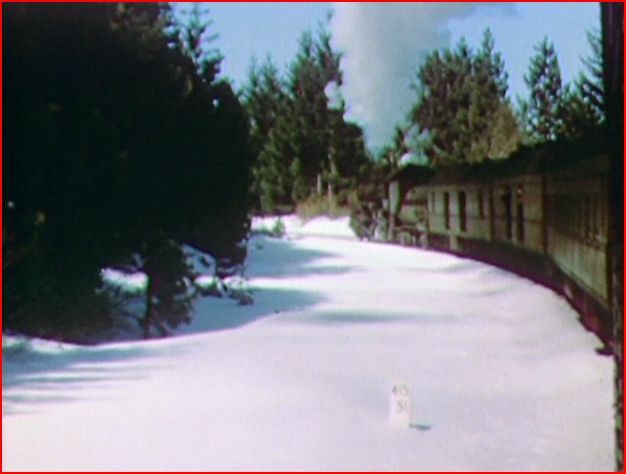 Footage from a passenger train continues to get us across the Siskiyou Line. More trains are viewed from trackside. There is a fascinating variety of steam engines. 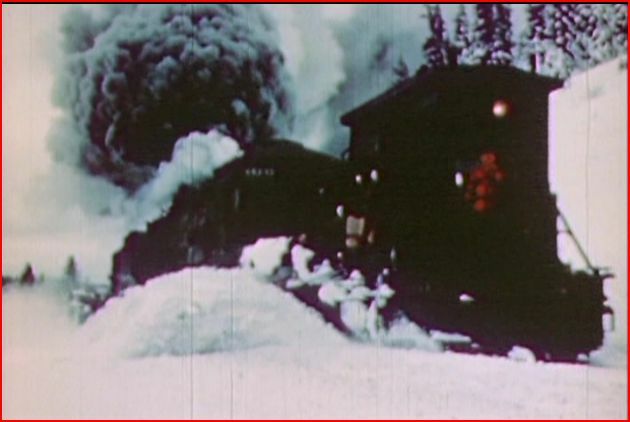 Steam era, snow service equipment is reviewed. A steam powered flanger. The spreader with a cab forward! A rotary plow is viewed as it clears the track. Sweet segment. The train continues through the area. A number of stations, with a few lines about the towns, add interest. At Black Butte, the train gets headed back to the mainline. Mt. Shasta looms large! Cab forwards get great coverage. Robert Church has more description, in the presence of a museum piece #4294, the last cab forward engine, built in 1944. An assortment of film on AC class articulateds, illustrate the story, in color! Earlier incarnations are also seen, as in some 1938 black and white films. 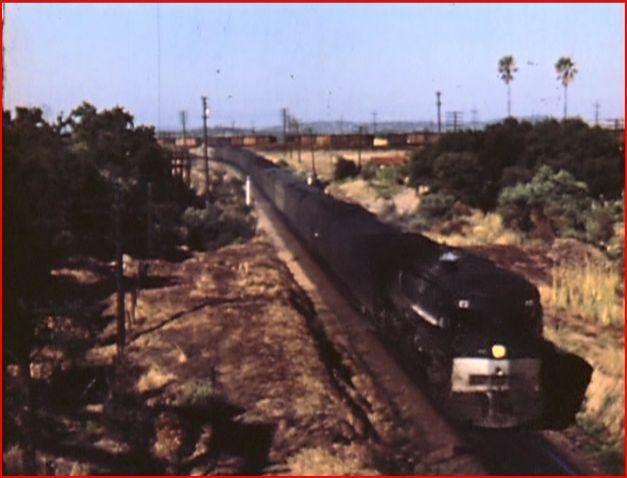 A 1957 excursion shows one of the passenger trains pulled by an AC. They were originally designed to get increasingly heavier freights over the mountains. General merchandise and reefer trains, as well. Effective and very informative study of these famous locomotives. The Modoc Line has a shorter chapter. Very different visually from the Siskiyou Line. Desert railroading, with cab forwards. A cab ride in a cab forward gives a feeling of the lonesome area. The films are digitally remastered. Production notes state that the films were cleaned, and treated using advanced techniques, before digital enhancement. Many sources were used to create this program. Much 16mm is evident. Some 8mm to complete the story. Overall, the film looks fabulous. 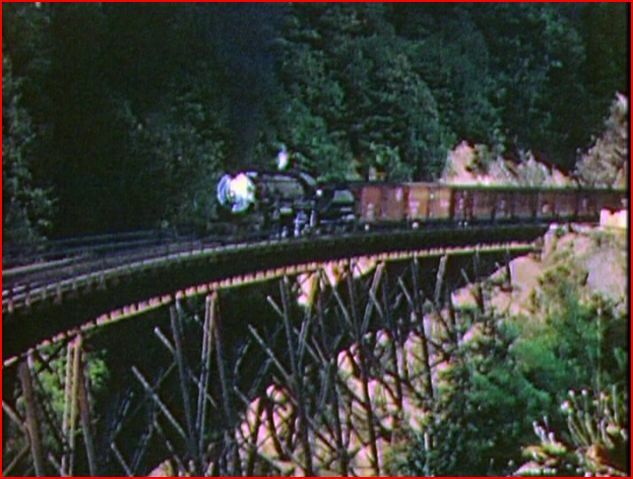 Catenary has achieved some spectacular results by the remastering process they have used on the old films. This ranges downward to very good on a few scenes. They do provide the best possible image quality, on footage dating back over 60 years! Realize, this is rare material, and includes amazing 16mm color film. Louis Stein had this fine pan shot. 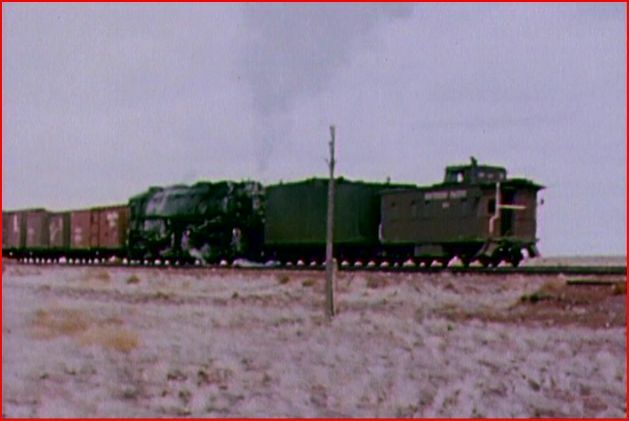 Original cinematographers shot some extended scenes of freight trains. Pan shots, cab action, and elevation views give us numerous viewpoints. Intriguing variation of content. Audio does contain some excellent, authentic natural sounds. Some background music is used on many other scenes. The script is very well written. Good balance on the whole of the presentation. A narrative runs almost continuously. The delivery by the narrator is very dry. Detached enough sounding, to somewhat detract from this splendid program. He does not really add anything, to match the rest of the show’s fine standards. The film and script, seem to drag him along for the ride. Much research has gone into the script here. A rare bibliography at the conclusion gives a hint of the work that was put into the writing. Catenary Video has combined the multitude of vintage films with modern production techniques. The wealth of films and excellent script, do give an enjoyable show. The show is available individually or in the boxset. The set includes a good looking, though rather thin case to house the shows. 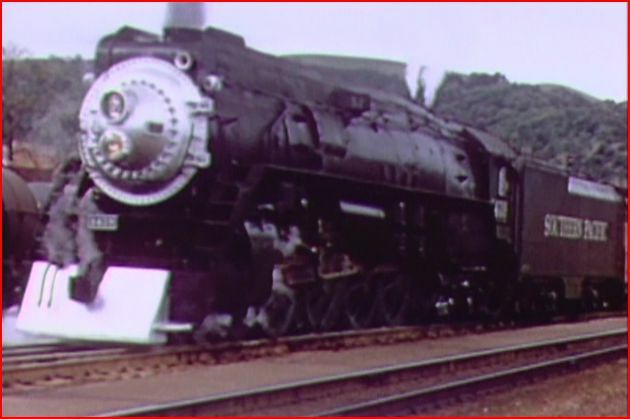 Southern Pacific’s Shasta Route, circa 1950: Volume 1 is a winner. All railfans, all ages should find this a very satisfying release. 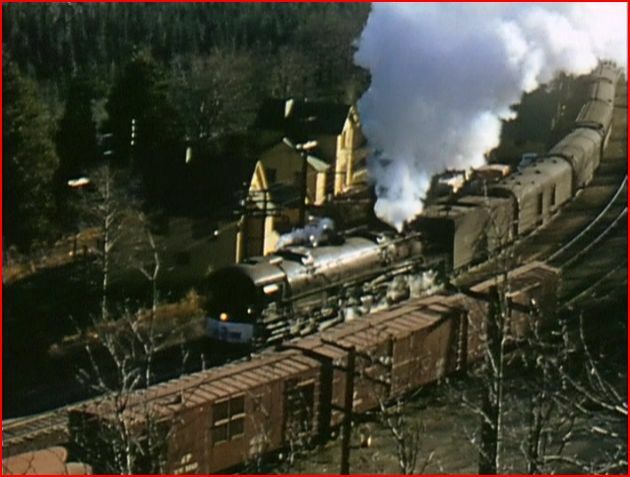 This entry was posted in ATVR Reviews, Catenary Video, Steam Train Reviews and tagged American Train Video Reviews, California, Railroad, Southern Pacific, Steam, Steam engine, steam train, transportation by William J. Hudson. Bookmark the permalink.